*Ignore list - if a program triggers elevator music when it shouldn't, now you can tell it not to play for that program ever again. *Music player muting - now elevator music won't play if you're listening to music in iTunes, Winamp or Foobar2000 (with a plugin). *Better file format support - now you can use M4A files (like from iTunes), Windows Media Audio files and FLAC (Free Lossless Audio Codec) files as elevator music. *Portable mode - take your elevator music with you! 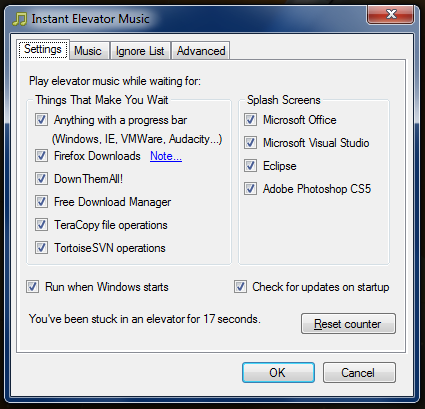 Run Instant Elevator Music from your USB drive. *New program support - including Free Download Manager, Microsoft Office 2010 and Photoshop CS5. *API - trigger elevator music from your own applications or from the command line. Great for build scripts. Qweas is providing links to Instant Elevator Music 2.0 as a courtesy, and makes no representations regarding Instant Elevator Music or any other applications or any information related thereto. Any questions, complaints or claims regarding this application Instant Elevator Music 2.0 must be directed to the appropriate software vendor. You may click the publisher link of Instant Elevator Music on the top of this page to get more details about the vendor.